Strategic move: Bhel chairman B.P. Rao said there have been initial talks between the two firms and that TBEA wants to work with it. New Delhi: From being competitors, India and China are increasingly seeking to join forces to tap opportunities offered by India’s power sector. Chinese companies are considering potential partnerships with state-owned Indian firms to shield their interests from the friction that has traditionally characterized business and diplomatic ties between the two countries. 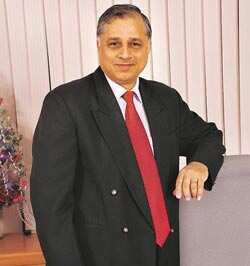 “TBEA, who are the biggest in China, want to work together with us," said Bhel chairman and managing director B.P. Rao. “There have been initial talks. TBEA wants to partner with us, as partnering with a public sector unit brings some comfort for a foreign player." The talks may lead to the first India-China public sector initiative in power equipment manufacturing. While TBEA manufactures electric power transformers of up to 1,000kV, Bhel has the capacity to make equipment of up to 400kV. 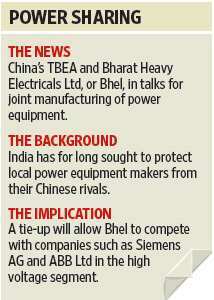 A tie-up with TBEA will allow Bhel to compete with companies such as Siemens AG and ABB Ltd in the high-voltage segment. Questions emailed to TBEA were not answered at the time of filing this story. High-voltage transformers are used in the power transmission sector to pump up voltage or to bring it down for electricity transfer across long distances. India has installed capacity of 153,000MW of electricity and inter-regional power transfer capacity of 19,800MW. “If it serves Bhel to align with any supplier in the world which has the technology and a demonstrated capability, they should be looking at it," said Shubhranshu Patnaik, executive director at audit and consulting firm PricewaterhouseCoopers. Bhel has been eyeing orders for building power transmission links across India and has been in talks with Japan’s Toshiba Corp. to form a joint venture. The state-owned firm plans to service a big spurt in demand for transmission links that is expected to emerge with the proposed addition of 78,577MW of power generation capacity by 2012. An equipment manufacturing tie-up will help it control costs while bidding for such projects. The high-voltage lines being tendered now will have the capacity to withstand variations of surge and decline in power transmission of the order of 800kV—almost double the existing capacity. State-owned electricity transmission company Power Grid Corp. of India Ltd, which operates around 70,100 circuit km of transmission lines, plans to more than double the inter-regional capacity of the national grid to 37,000MW by 2012. This would require the strengthening of regional grids and building more inter-regional links at an investment of Rs55,000 crore. It is contracts such as these that Bhel wants to bid for. “Bhel does not have the technology for high-voltage transformers and equipment," said Madanagopal R., an equity research analyst at Centrum Broking Pvt. Ltd. “Any such collaboration will help Bhel as it will be able to bid for high-voltage orders such as those of PowerGrid." This development assumes significance given that India has for long sought to protect local power equipment makers from their Chinese rivals. Interestingly, both Bhel and Larsen and Toubro Ltd (L&T), which have been lobbying against Chinese firms with the Indian government, are now looking at cooperation as the way forward. Mint had reported on 6 November about L&T starting preliminary talks with China’s largest power generation equipment manufacturer, Dongfang Electric Corp., for joint participation in hydroelectric power projects. China exported $31.33 billion (Rs1.46 trillion today) of goods to India in 2008-09.